I was sleeping over at my cousins house when my uncle Joe offered to take us fishing. He is a professional fisherman. He helped me cast and I sat there. I waited all day on the shore in Monmouth NJ and I didn't catch anything. Just before we packed up and went home, I got a catch. It took five minutes to reel in and at one point the striped bass even took the rod out of my hand and dragged it to the ocean! We finally reeled it in and brought it to the nearest bait shop and weighed it. 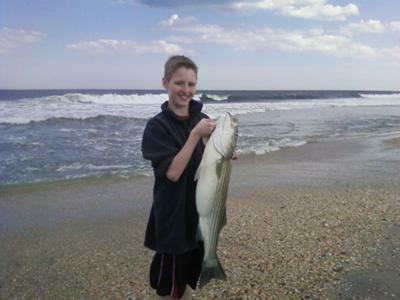 The fish was caught at 7:56 a.m. on June 9th 2011. 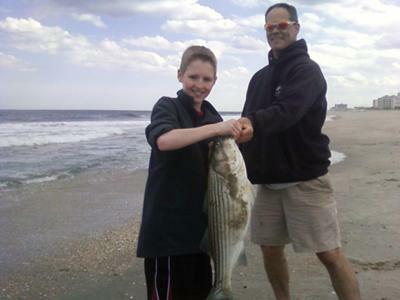 It was a striper bass that weighed out to be 16 pounds, 34.5 inches long. 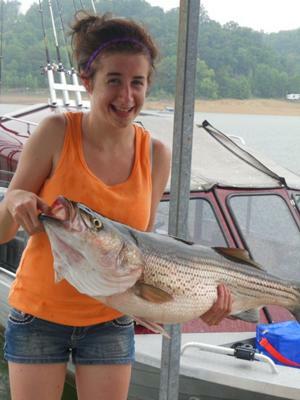 I caught the striper in Somerset, Kentucky on the Cumberland Lake, which is in Russell Springs, Kentucky. 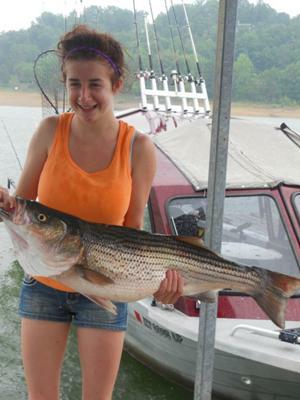 It was a female striper that was full of eggs when the guide cleaned her at the end of the long, hot day. My guide J.R. Stevens put us right on the hot spot - that's where I caught the huge striper, and everyone else in the boat did not catch a fish as big as mine all day long. So yes, I was so excited and happy!!!!!!!!!!!! !